As China prepares to welcome the leaders of the G20 Summit, the organisers of the G20 Interfaith Summit are shaping the largest interfaith gathering in the East. There will be a pre-conference in Fiji, on 2 – 4 May. ROME—The Vatican announced on Tuesday that Pope Francis will declare Mother Teresa of Kolkata a saint on Sept. 4, one day before the 19th anniversary of her death. Cardinal Peter Turkson, President of the Pontifical Council for Justice and Peace, delivered one talk to the Global Responsibility 2030 conference meeting in Bad Honnef, Germany on Saturday on 5 March 2016. The Cardinal’s talk was entitled The MDGs and the Post-2015-Process as a challenge for the Universal Church and discussed Catholic social teaching, integral ecology and sustainable development. Women have gathered in the Vatican and highlighted their great contributions to the world and Church. The event shared stories of women who have extraordinarily helped other women reach their potential. Many readers would be aware that in Australia, some state police forces have multi-faith liaison groups made up of faith leaders and police command, which meet on a regular basis. We support the formation of similar multi-faith liaison groups with police command in all states. 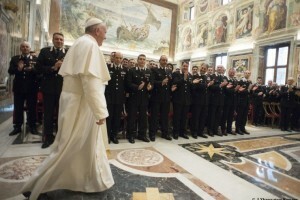 In this wise, we bring you the address of Pope Francis to the Vatican Detachment of the Roma Police Force.